Actor Tim Healy with Hartlepool's Daniel Cooper. A schoolboy actor learned valuable tips from the top when he met Geordie television star Tim Healy. Daniel Cooper, 14,from Hartlepool, spoke with the Auf Wiedersehen, Pet and Benidorm actor during his recent An Evening with Tim Healy show in Newcastle. Tim Healy, right, on stage with Hartlepool presenter Paul Gough. Daniel, who has already appeared on London stages and television during his promising career, said afterwards: "It was such a thrill to meet Tim. "I love him on the telly and he just makes it all look so very easy. "My mam and dad first got me to watch him in Auf Wiedersehen, Pet when it was repeated on one of the satellite TV stations a few months ago. "He was superb as the gaffer and the chemistry on the show was as good as it gets. It is acting of the very highest level." “Tim told me that he had been a welder and went home one day to tell his parents that he wanted to quit his job and instead enroll in a course at Durham University and that is where his dream really started to happen for him as an actor. "Tim said that some friends were shocked when he made a dramatic switch. "He believes that hard work and a will to win were the reasons he drove himself to a breakthrough against the backdrop of some negativity." Their meeting was set up by presenter Paul "Goffy" Gough, from Hartlepool, who compered the Blakelaw Social Club show. Tim, currently starring alongside Still Open All Hours with David Jason, said: "Goffy asked me to help young Daniel with some advice and It was a real pleasure to meet him with his family. "I know he is very talented and I just love to see how enthusiastic the next generation of young actors are. Daniel was all of that. "He was a real credit to his mam Shirley and dad Stephen. "I take great joy and pride from seeing so many youngsters benefit from the ongoing charity work I am involved in with my friends. "It would be brilliant to see Daniel progress and do his bit for the North East and his home town of Hartlepool." 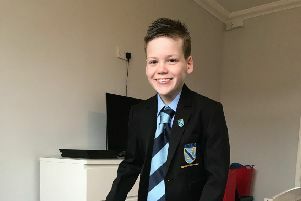 Daniel, a pupil at Hartlepool's St Hild's School, also attends the Pauline Quirke Academy, in Stockton, and the popular Hartlepool Mick Donnelly Music Academy.